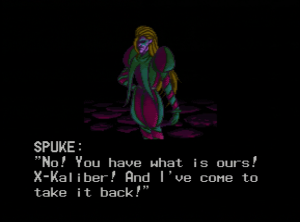 Criticizing the plot of a side-scrolling action game from early 1994 is a little unfair, but X-Kaliber feels like it was written by a Compuserve chatroom full of home-schooled anime fans. The intro really sets the pace – Let’s take a trip to the greatest of all generic sci-fi locations, Neo N.Y. What happened to Old N.Y.? I dunno, but it must have been bad, as LIFE HAS GROUND TO A STANDSTILL AND THERE ARE NO MORE JOBS TO GO TO (Seriously, watch the intro). People are just going around doing what they are told or nothing at all. It sounds a lot like present day Detroit. ANYWAY, Neo N.Y. is ruled by a guy in a purple suit named Raptor, who apparently works for a “global mob.” In order to “enforce order,” he has unleashed his private army of “Morphs” on the city. One wonders why you need to enforce order when people are doing “what they are told or nothing at all.” Sounds like things are pretty orderly already. 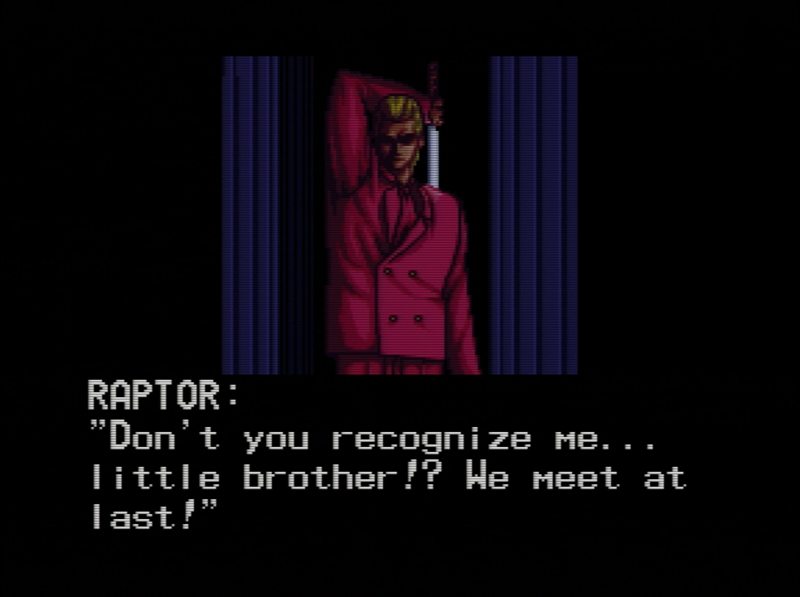 There are only two people that stand in Raptor’s way: A man named Slash (the player character), and his partner Alix. Raptor and Alix are repeatedly referred to as “agents,” so presumably they work for some kind of “agency.” Despite this, there are only two people that stand in Raptor’s way. Maybe that’s like how me and my friend Rob formed a gang that had no other members. Despite this numbers disadvantage, all is not lost! Raptor has the X-Kailber, a magic sword that can rip through steel like rancid butter, yet can’t kill an enemy in less than two hits. Slash and his sword scare Raptor so much, that he and his subordinate, Kane, formulate a plan to draw Raptor out by kidnapping Alix. Once Slash shows up, they figure that they’ll defeat him, grab X-Kailber, and get back to imposing order. His name is KANE. Get it? GET IT? 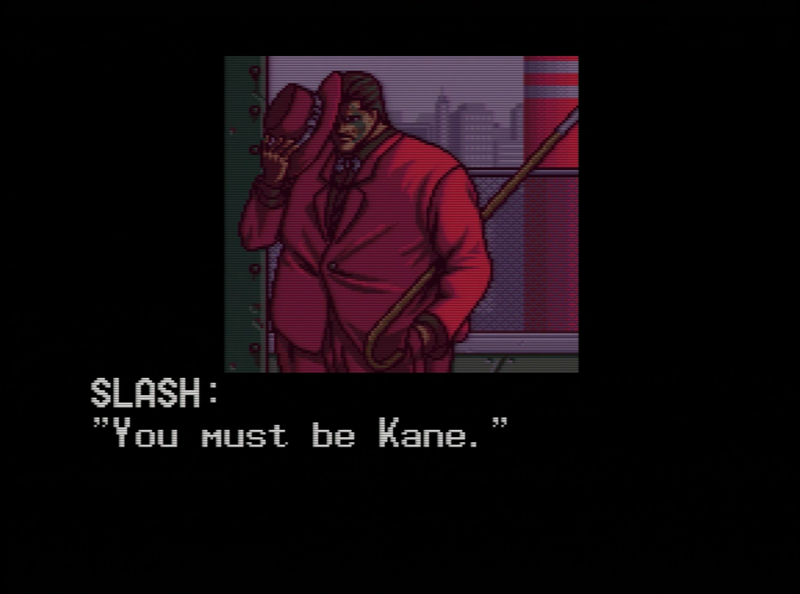 As you’d expect from a guy with such a rad name, Slash is having none of this. 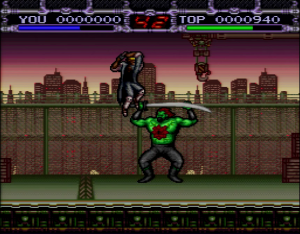 The player leads him on a rescue mission through Neo N.Y., using the titular X-Kaliber to systematically chop down Raptor’s subordinates (who have awesome names like “Chainsaw,” and “Dr. Blast”) one by one. 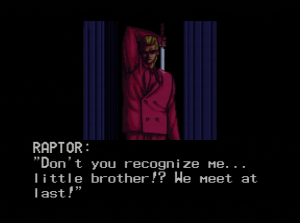 So, Slash, uh, slashes his ways through the requisite 16-bit skyscrapers, sewers, nightclubs, and laboratories, all the way to Raptor, only to find all along, that his arch-nemesis, whom he has apparently never met before, is his older brother! This shocking revelation really doesn’t seem to phase Slash all that much, but just as he is about to cut his estranged sibling to ribbons, Raptor lets him in on the shocking truth: Raptor’s entire operation is nothing but a puppet regime, propped up by gangster from another dimension named Krux. Of course, Krux has also kidnapped Alix. My God! Slash somehow acquired X-Kaliber from the inter-dimensional gangsters? How did he manage to do this without learning about the fact that they were propping up the oppressive global mob that’s been depriving people of jobs and imposing order? Did the gangsters maybe just drop it somewhere, leaving Slash to absent-mindedly pick it up off the streets of Neo Hell’s Kitchen? We’ll never know. I’ll post a link to my X-Kaliber 2097 Fanfic Kickstarter a little later down the road, and with any luck, we’ll be able to resolve this as a community. 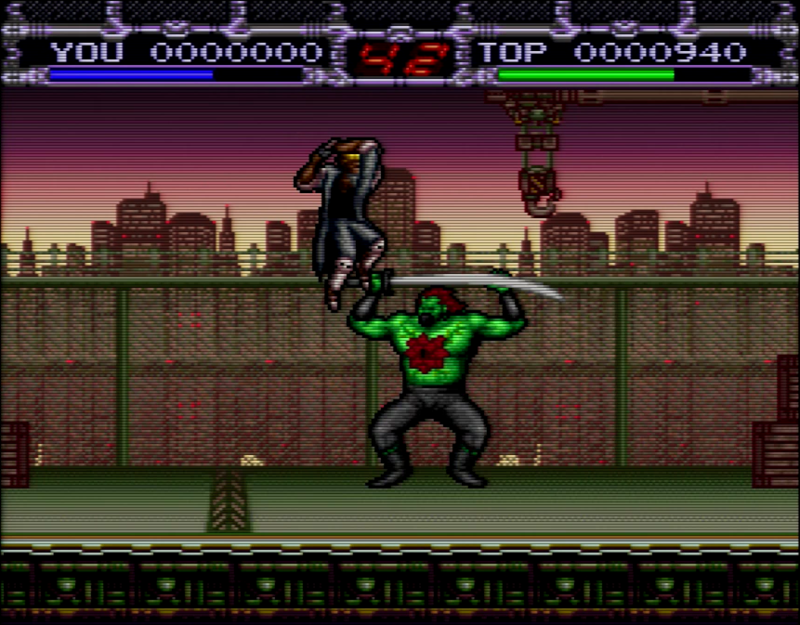 After several continues, Slash quickly realizes that Krux’s weakness is jumping sword thrusts to the head, and he defeats the great inter-dimensional crime lord once and for all. Slash rescues Alix, and order is uh… renewed? I’m not exactly sure what happens, but a brief post-battle cut-scene advises us that the people of Neo N.Y. are inspired by the example set by Alix and Slash, and begin to live a life that is filled with parks to visit and jobs to go to. And thus, the world is saved. In 1994, action games weren’t typically known as narrative powerhouses, nor did they typically attempt to be. X-Kaliber 2097, however, aspires to more, and fails miserably. Double Dragon, one of the forefathers of the genre, had the simplest of plots: Some guy punched your girlfriend and walked off with her; go get her back. At its core, X-Kaliber has the same plot: Your partner/girlfriend has been captured, and now you must rescue her. X-Kaliber, however, pads out its narrative with more ridiculous cliches and plot twists than its small frame can handle. When you’re going to be telling a story in less than 500 words of dialogue, less is more, and X-Kaliber 2097 is about 20 gallons of plot in a 5 gallon jug. A story that should have been nothing more than window dressing becomes a notable flaw. 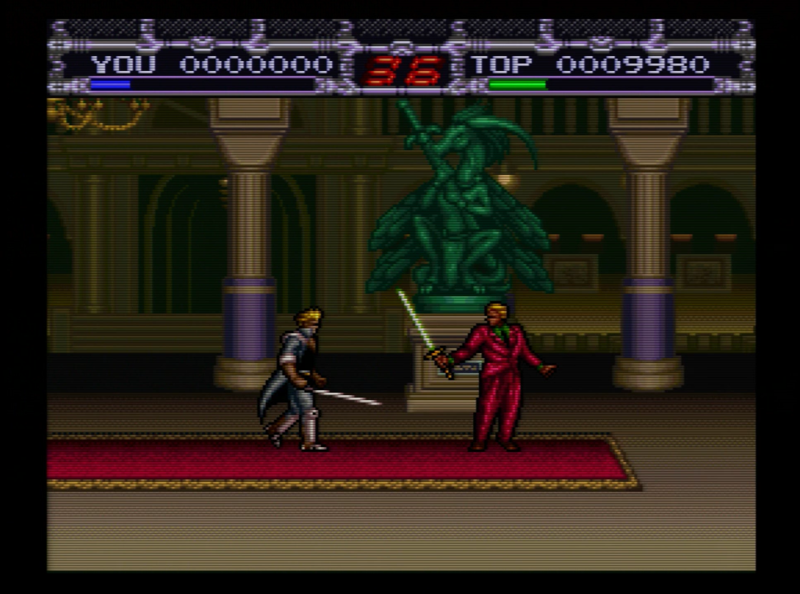 In Japan, this game was released as Sword Maniac. Sword Maniac apparently had an entirely different plot, but with a title that awesome, they could have dispensed with a plot entirely. 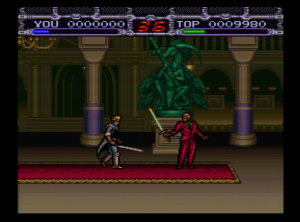 It practically writes itself: Maniac with sword runs through post-apocalyptic New York and fights Satan. That’s a story I can get behind. 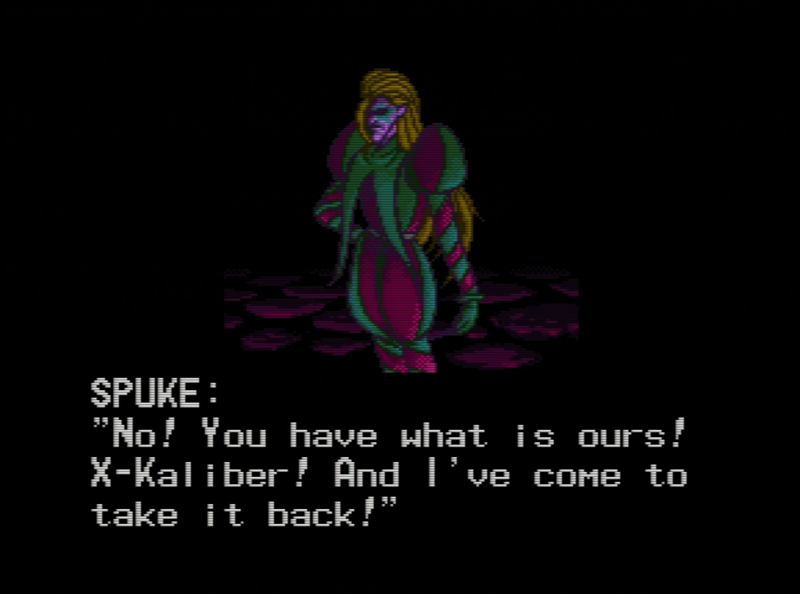 Plot aside, X-Kaliber is about what you would expect from a mid-tier action game released in 1994. 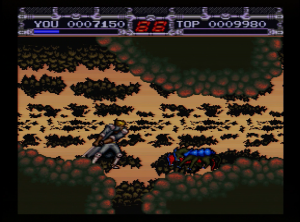 Graphics are competent, though mostly unspectacular. 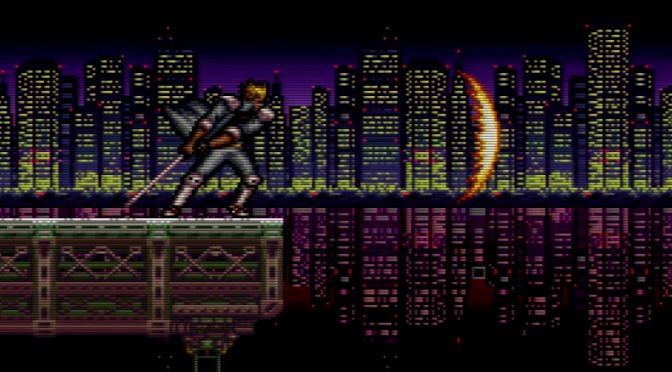 There are nice little graphical flourishes here and there – spotlights that follow the player during a boss fight, multiple scrolling layers in backgrounds, beautiful 16-bit cityscapes – but nothing X-Kaliber attempts is going to blow your mind, but it’s not unpleasant to look at. 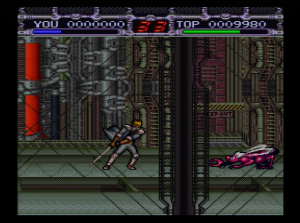 At the time of the game’s release, much was made of the fact that it featured the music of techno/industrial group Psykosonik. Gamers of the era may remember Psykosonik for their contributions to the soundtrack for the first Mortal Kombat film. 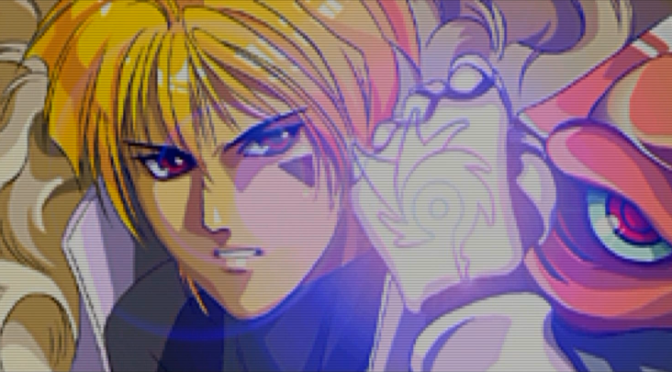 Internet research reveals that X-Kaliber’s soundtrack features chiptune versions of several songs from Pykosonik’s first album. As a result, the game’s soundtrack is above-average, if not spectacular. Despite this, you can’t help but feel like the sound designers may have been pushing the SNES a little too hard – as good as that sound chip was, it wasn’t going to emulate the sounds of a professionally produced contemporary techno outfit. The gameplay is simple and straightfoward. 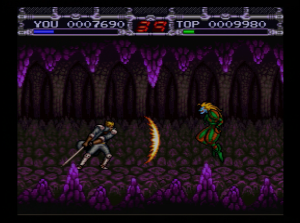 Slash has four basic attacks: a standard slash, an overhead swipe, a stab, and ranged fireball, which travels the length of the scree but leaves the player vulnerable for an extended period of time. Most, if not all, enemy attacks can be blocked by holding down the X button to assume a defensive stance, but in my playthrough, I found little reason to bother with defense: most enemies stick to fairly avoidable patterns. Bosses are an exercise in exploitation: defeating them is not a matter of mastering any of Slash’s techniques or memorizing attack patterns, but figuring out the one single tactic they haven’t been programmed to deal with (tip: it usually involves jumping and slashing or repeatedly holding out your sword and hoping they walk into it). All in all, the experience is wholly unremarkable. X-Kaliber feels like it could have benefited from stronger direction. 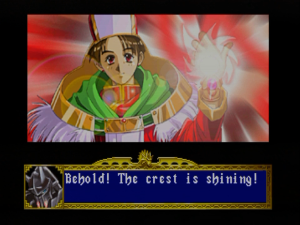 While it has flashes of graphical brilliance, and its soundtrack is well-composed, if not well-executed, the game never rises above the level of “competent.” The occasional song or anime style cut-scene will raise an eyebrow, but the whole package never comes together, and ultimately, the only truly memorable thing about the game is its painfully overwrought plot. X-Kaliber couldn’t live up to its hype as a new release in 1994, and it failed to intrigue me as a historical curiosity in in 2014. Was it worth five clams? Probably. Could I recommend that you spend any of your precious time playing it? Probably not. 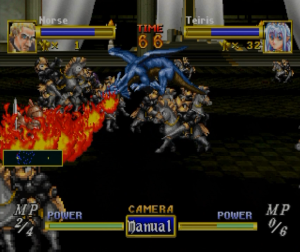 Released to western audiences in November of 1996, Dragon Force is one of the Sega Saturn’s true classics. While it would not be incorrect to call Dragon Force a real time strategy game, its unique brand of gameplay truly defies traditional genre classification. It’s a one of a kind experience that exemplifies the unconventional, “outside of the box” qualities that endeared Saturn owners to Sega’s console even as it was eclipsed by its generational rivals. Dragon Force tells a *relatively* simple fantasy story of a divided continent on the precipice of a demonic invasion. 300 years ago, the continent of Legendra was besieged by the dark god Madruk. 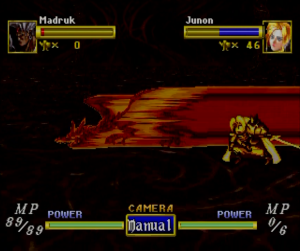 Legendra was saved only by the appearance of the Star Dragon, Harsgalt, who emerged to challenge Madruk. While Harsgalt was victorious, he was unable to slay Madruk, merely seal him away. 300 years later, Madruk is poised to break that seal, and it falls on the eight members of the Dragon Force, who have inherited Harsgalt’s power, to unify the continent and brace for Madruk’s awakening. 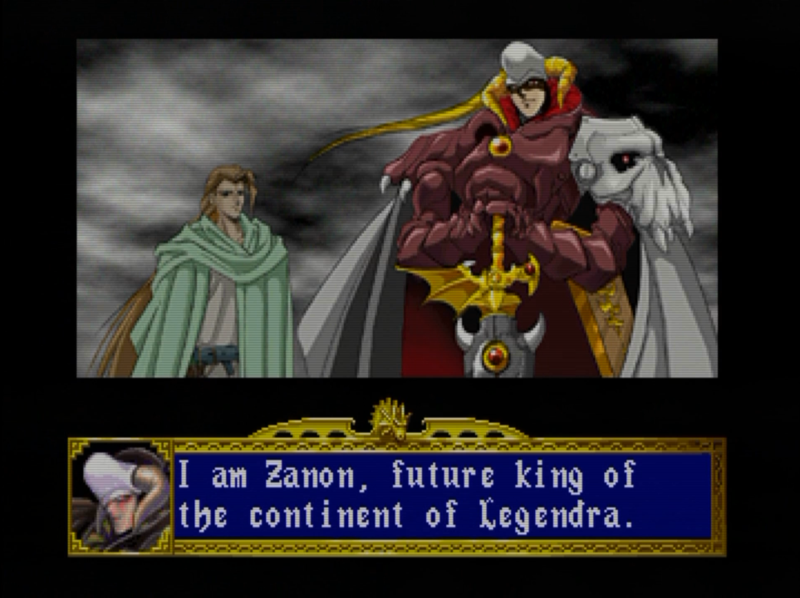 The player assumes the role of one of the eight playable members of the Dragon Force – more often than not, the only one who is aware that he or she actually is a member of the Dragon Force. The player must lead an army to conquer Legendra in an effort to locate the other seven members of the Dragon Force and bring stability to the land before Madruk reawakens. 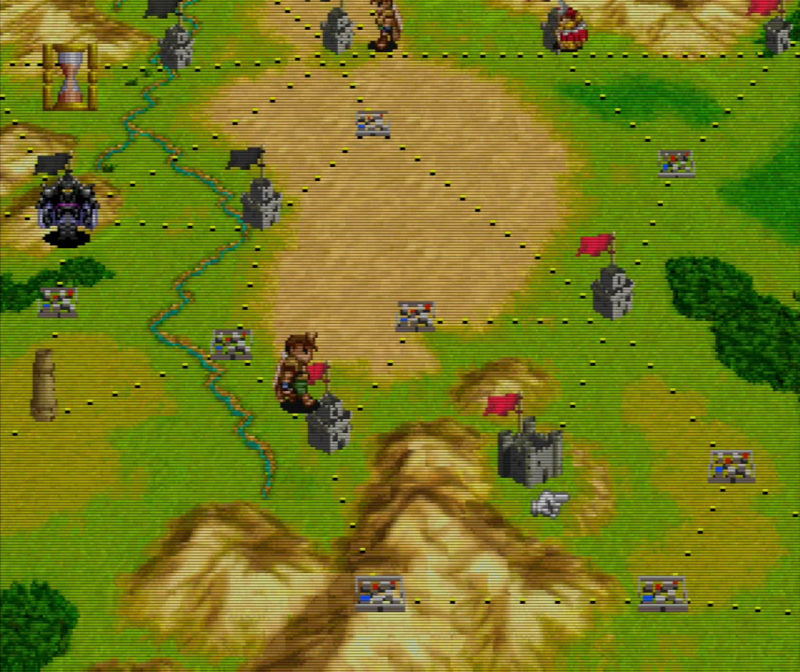 The player’s armies move along in real time along pre-defined “roads” on the map. Each “week” of gameplay time is divided into two phases: a “strategic phase” where the player moves their armies and fights opposing forces, and an “administrative phase” where the player manages his generals and fortifications. The strategic phase is where the meat of the game takes place, as the player moves his armies across the world map in an effort to conquer enemy fortifications and defend his kingdom from invading forces. Armies in Dragon Force are comprised of groups of generals, each of whom can command up to 100 troops when fully leveled. 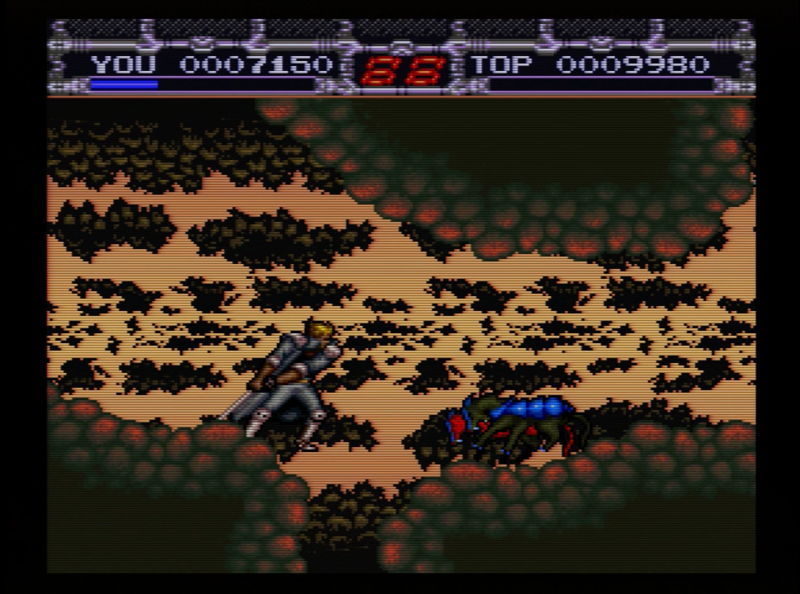 When two armies collide, Dragon Force switches to a side-view of the battlefield, and sprite based carnage ensues. 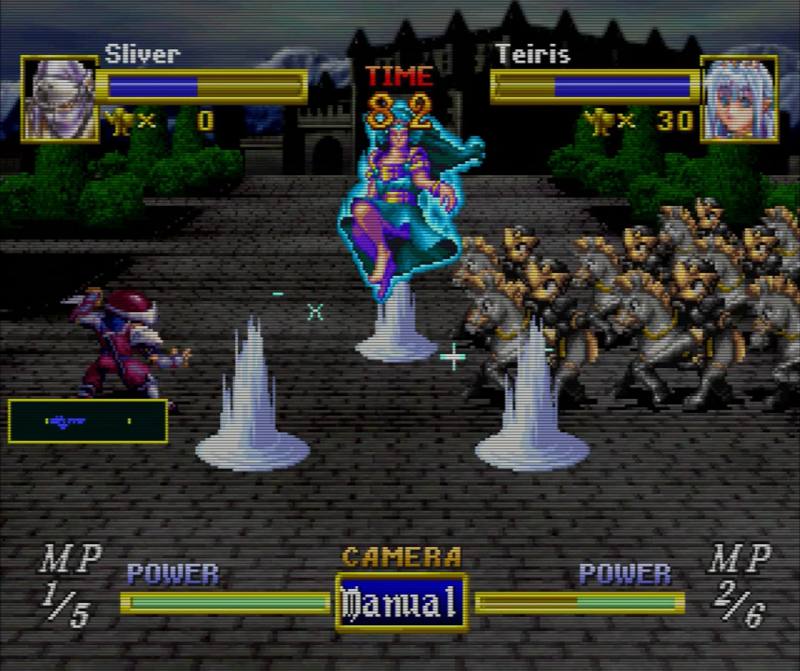 The player selects the starting formation of his troops, and as the battle progresses, he can command those troops to move around the battlefield as he sees fit. 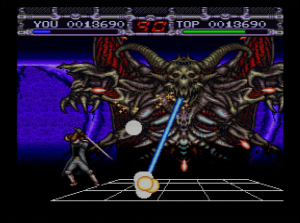 With upwards of 200 sprites moving around the battlefield at any one moment, Dragon Force really showcases the Saturn’s 2D capabilities. Adding a little more sizzle to the proverbial steak, Dragon Force offers 10 distinct troop types, ranging from rank and file infantry to mythical beasts, each with their own strengths, weaknesses, and terrain effects, creating a staggering amount of matchups. 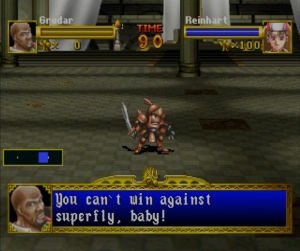 Further, throughout the course of the game, the player can acquire well-over 100 generals, each of whom has three separate special attacks which can impact a battle in a number of different ways. Pairing the right general with the right troop type can completely subvert otherwise insurmountable odds. Each victory earns the player an “award” which can be bestowed upon one of his generals during the administrative phase. Each award allows its recipient to command ten additional troops. While awards can be bestowed upon any general in your force, if you fail to promote a general after they win a battle, they may become disgruntled, and defect from your army. While this rarely has any meaningful impact on gameplay, it does add a nice little wrinkle to the game’s character progression system. While it would be generous to call Dragon Force’s plot anything other than “serviceable,” it’s bolstered by a colorful translation from publisher Working Designs. While most generals only have a handful of lines, the famed translation house managed to fill them with as much personality as possible. Key story elements are also accompanied by beautiful, hand drawn still frames which go a long way towards giving the story a sense of gravitas. It’s difficult to find much fault with Dragon Force’s classic 2D visuals. On the battlefield, troops and generals are represented by large, expressive sprites. While the frames of animation for each individual character are somewhat limited, this deficiency is offset by the sheer spectacle of seeing upwards of 200 troops duke it out in real time simultaneously. 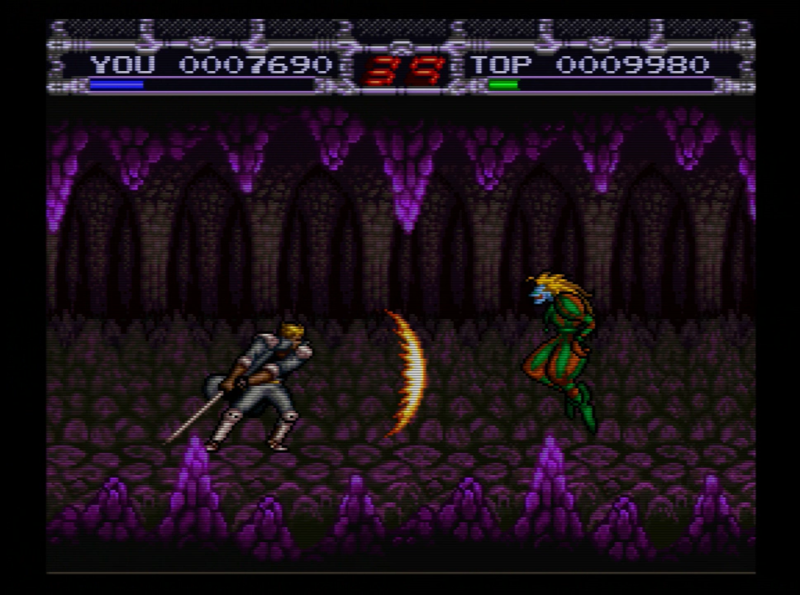 Backgrounds are colorful and varied, and massive spell effects leap off the screen with colorful ferocity. Sound and music are more than competent, if not a little repetitive. Each monarch has their own personalized overworld theme, and the music which accompanies story sequences and battles is atmospheric and appropriate. The game’s main theme is an exuberant standout, but a little more variation would have been welcome, particularly given the fact that your average Dragon Force playthrough can last over 20 hours – if you want to try out more than one of the monarchs, you might want to download some podcasts before you begin. Hope you like this character design. You’ll be seeing it a lot. 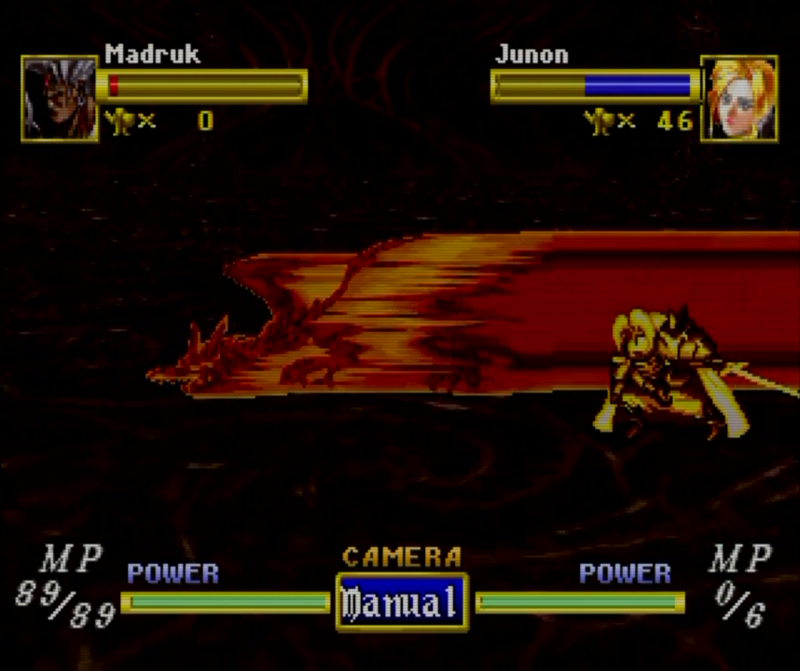 If Dragon Force has any one significant flaw, it’s that that its average turn length can run a little long. Gameplay can only be saved during the administrative phase, and with over one hundred generals who can fight multiple battles in a single strategic phase, sometimes you’ll be waiting for hours at a time between save points. This is slightly mitigated by the fact that you can “suspend” gameplay mid turn if you have a functioning Saturn memory cart – a luxury that is increasingly short supply in this day and age. 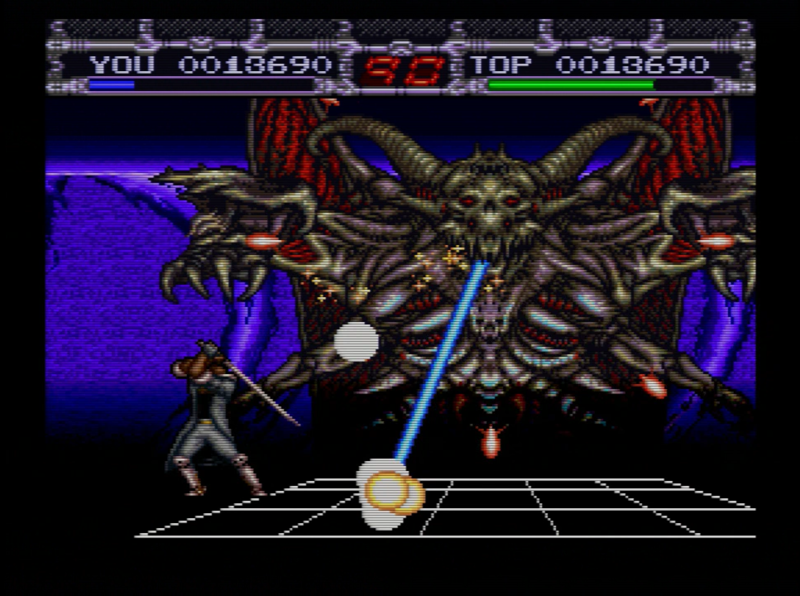 Dragon Force is a true Saturn classic; a game that really showcases the console’s strengths as a 2D workhorse. 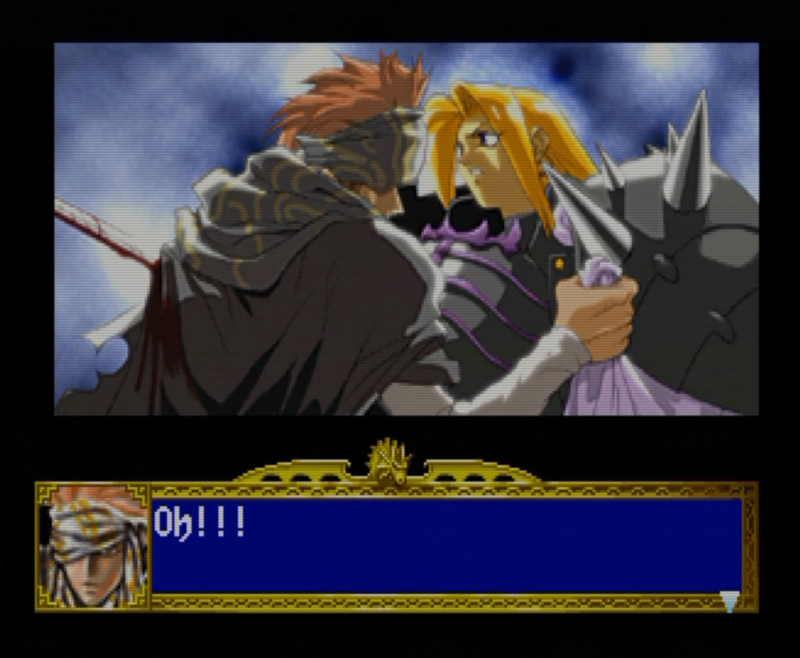 It feels like it simply could not have been done on the PSX or N64. 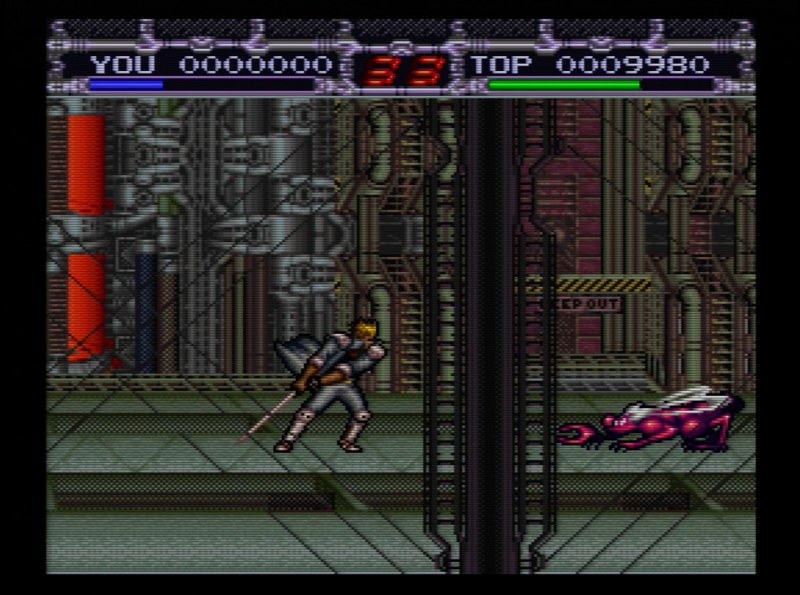 At the time, it was all you could have asked for in a platform exclusive, and its gameplay is still compelling today. If you’ve got the means to play it, I strongly suggest that you do. Not exactly. There is a sequel that has yet to receive an English translation, official or otherwise. 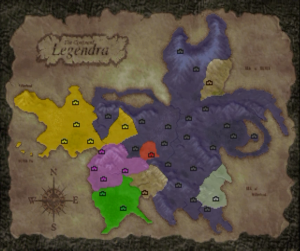 Amazingly, most of the people of Legendra seem to have forgotten all of this relatively recent history by the time the game begins. 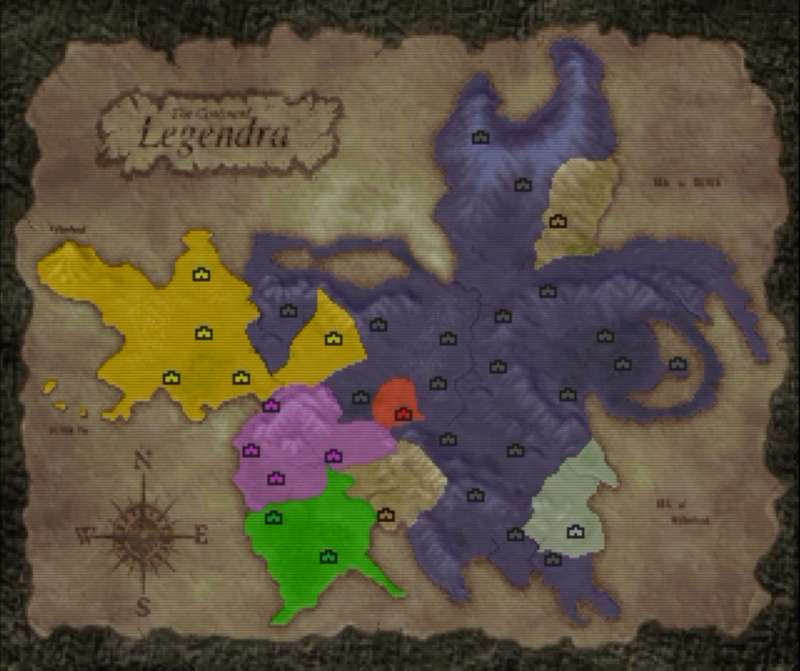 The map of Legendra is not unlike a board game, and the player’s armies are the pieces. While the pieces move in real time, they can only move along pre-defined routes on the map. One should note that this might be considered a negative, depending on your general feelings regarding Victor Ireland’s sense of humor.